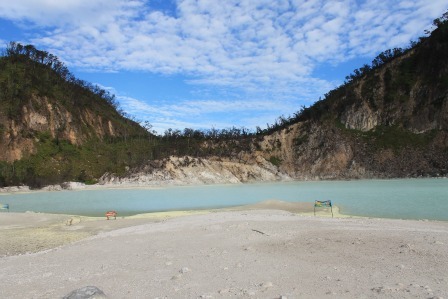 Kawah putih or white crater is located in Ciwidey approximately between 1 ½ and 2 hour drive from Central Bandung if you're not getting stuck in the traffic. If you want to visit this unspoiled beauty try to leave as early as possible to avoid the busy traffic which can be feeling as eternity. So wake up early please. 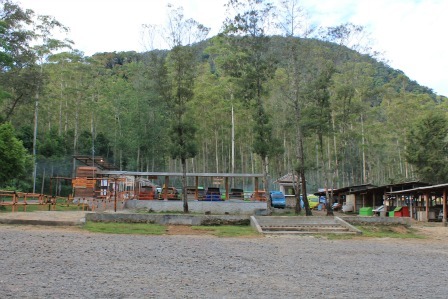 When we’re planning to make a trip to this area of Bandung, we woke up very early also, about 3 o’clock in the morning. Our children (and the big ones too) have to woke up early too despite that they were complaining. But the little one were excited. We were leaving around 5 o’clock. We were planning earlier than this time, to get a view of sunrise which is very beautiful. But too bad, our children were too slow with their preparation, oh my God; sometimes we must pull their ears to make them hurry. But we couldn’t do anything to make them as fast as we do. So anyway we were leaving later than we were planning. Once we departure later than 5 o'clock in the morning we could be stuck in the traffic chaos. We need to drive kopo Street en soreang Street which are very busy, so the journey can be much longer than 2 hours. 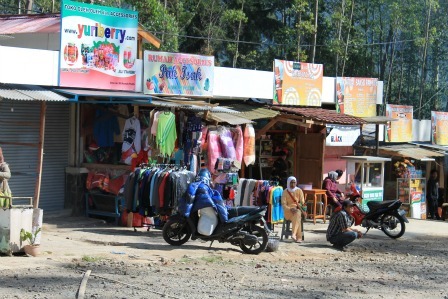 When we’re pass these streets the market is already begin and the school children around this area already make their journey to school which are very early about 7 o’clock in the morning begin the school in Indonesia, which makes these streets are very busy. 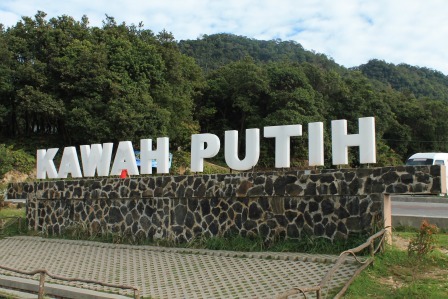 So I advise you to leave as soon as possible in the morning if you want to enjoy a day out to ciwidey, a place where you can certainly come to rest with this stunning natural beauty without getting annoying about the traffic which is very frustrating sometimes. 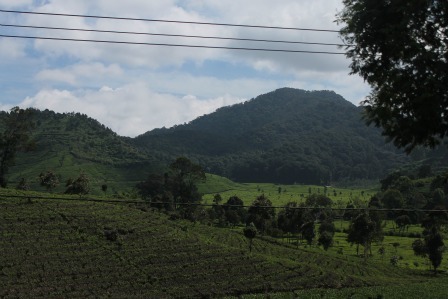 Once we're outside soreang, the way is getting up and then we get the most beautiful scenery on the way. I bet you don’t want to miss this view. It filled with rice fields and on the background the lovely mountains around Bandung. 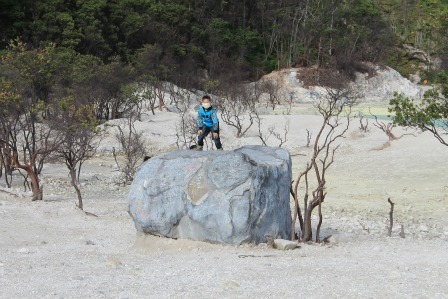 And then we come in kawah putih area, a place where we can park your car and proceed with the special car to go upwards, which we don’t do that. In the end we were regret that we don’t use that special car. Why? I can tell you, use that special car if you don’t want to drive by yourself. The way up is very small and dangerous. The driver for the special car is already usual with the environment which makes them easier to go up. 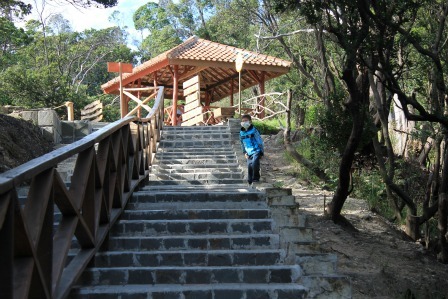 So finally we reach the park area and go walking to the area of the crater which is very quiet when we were arriving. So peaceful. What a view, isn't it? Too bad we were late to watch the sunrise. We were arriving by 7 o’clock and the sun is already shining, but we still need our warm clothes, regardless the sunshine. But sunrise or not it’s still a breathtaking view. 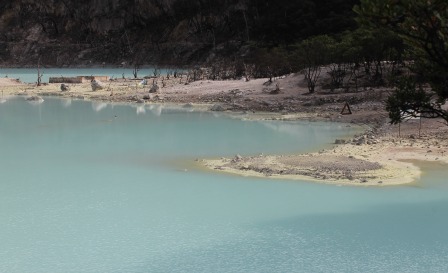 This beautiful white crater lake is formed by the active volcano of Mount Patuha. The crater looks like a lake surrounded by mountains. 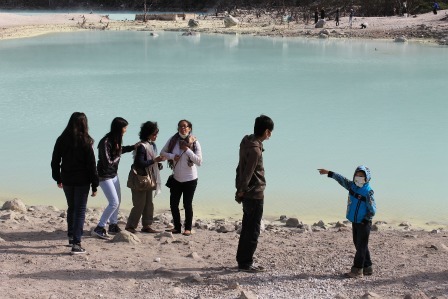 The water is warm and has a high sulfur content.The reflection of the sunshine makes the color of the water frequently change from milky white to white green. 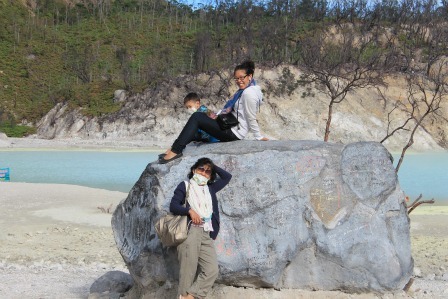 We had a really good time at kawah putih. See our photo’s here how we can laugh on each other. It’s family time. 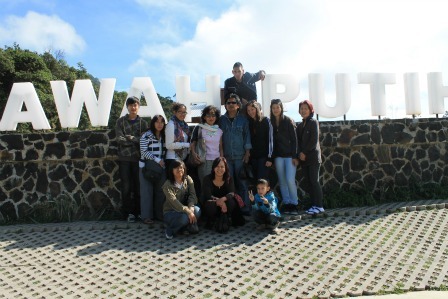 And then we make pictures with all of them at the entrance, so the memory will always be with us, the priceless moment. 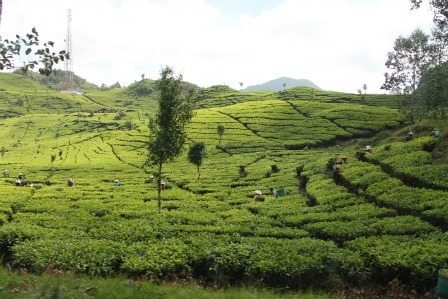 Our journey is not ended yet, and when we were leaving this white crater, we pass a green panorama of tea plantation. 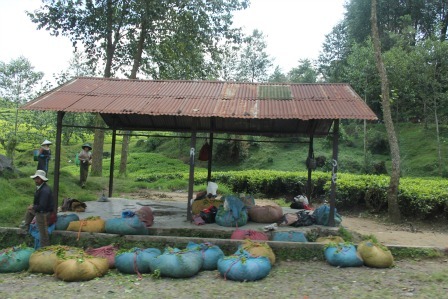 We see Hundreds of local workers are picking tea leaves here. They seems happy with their simply life. We should do too. But of course we have very good time with our children; they are lovable too … sometimes. 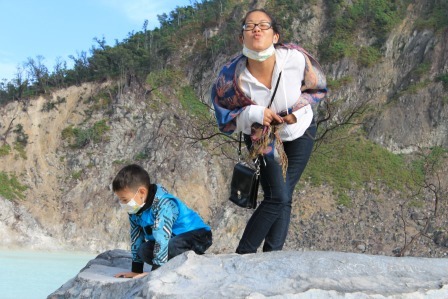 See our adventure in Patenggang Lake.